I was enjoying a delicious dinner and martini (*Bad Girl, Courtney*) last night at Henlopen City Oyster House, when my husband and I started reminiscing about our Chicago trip a few months ago. Chicago is the perfect long weekend destination. We had great weather, dined on delicious food, toured the city, and – my favorite part – got to run a race while we were in town! 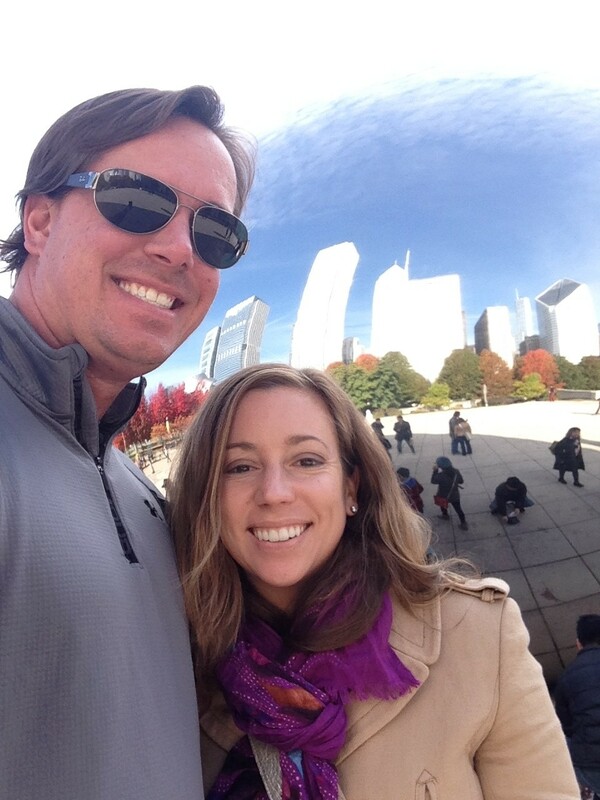 We decided to take advantage of Veterans Day falling on a Monday – so we booked our flights to Chi Town. A few days later, I was checking the random emails I get from Active.com and a race called Chicago’s Perfect 10 was highlighted. This race just happened to be the same weekend we would be in town – SCORE for me! I immediately signed myself up for the ten mile option and my husband up for the 10K option. The race was held on Saturday November 10th. Packet pickup was available the morning of the race or at three Road Runner Sports locations. We picked up our packets on Friday night at a Road Runner Sports location that was conveniently located next to Goose Island Brewery- one of the breweries we had wanted to check out anyway. The morning of the race we had a nice easy walk to the starting line at the Navy Pier. There are so many hotels near the Pier that finding close lodging for this race is not a problem. The race started at the end of the Pier where everyone lined up and enjoyed a DJ playing great music while we waited. While I was waiting for the race to start, I noticed an older gentlemen in front of me who had on a Rehoboth Beach marathon shirt! How ironic is it that I travel halfway across the country and find someone who has run a race in my home state. Turns out this gentleman was in the process of completing a marathon in each state. Very inspiring! Beautiful course! It’s an out and back along Lake Michigan. 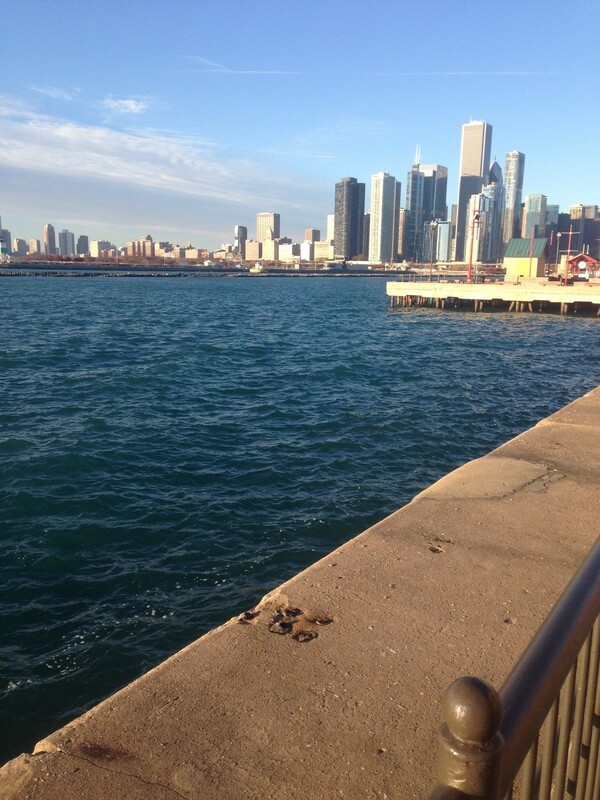 The views of Chicago are amazing! 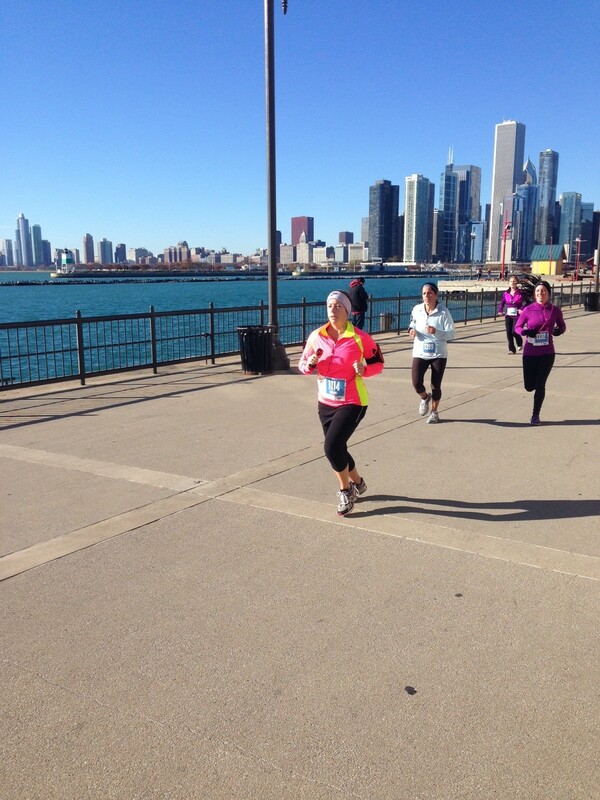 Great finish at Navy Pier! The finish is exciting with lots of cheering spectators. After party is inside! Wind down after the race inside with some local brews and browse l the health and fitness related vendors. Awesome swag! Spinning finishers medal, long sleeve hoodie, post-race food and brews, and VIP status to Road Runner Sports for a year! That means discounts on your purchases and free super-fast shipping! This race was awesome! I finished in 1:30 for an average pace of 9 min per mile. Jimmy finished his 10k in 1:10 and he felt great the whole race! Chicago’s Perfect Ten is scheduled for November Saturday November 8, 2014. If you live close- sign up now before prices increase. Live far away and haven’t been to Chicago? Well maybe it’s time to plan a trip! Nothing like a little fun, fitness, and vacation!